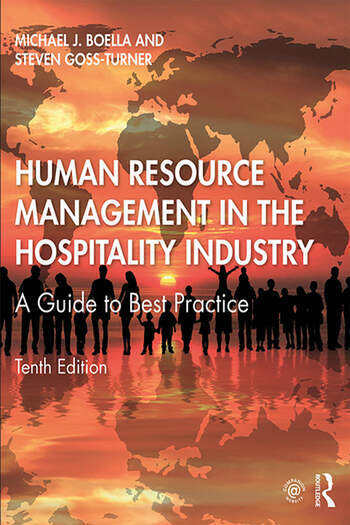 Human Resource Management in the Hospitality Industry: A Guide to Best Practice takes a 'process' approach and provides the reader with an essential understanding of the purpose, policies and processes concerned with managing an enterprise’s workforce within the current business and social environment. Extensively updated content to reflect recent issues and trends relevant to the hospitality industry including: changing labour market profiles and the ‘gig’ economy, the digital transformation of HRM practices, employer branding developments, talent management strategies, employee well-being considerations, and contemporary concerns over diversity, gender and harassment at work. Five new chapters on: organisational culture, modern labour markets, emotions and well-being, careers in hospitality and digital HRM. New international case studies throughout to explore key issues and show real life applications of HRM in the Hospitality industry. Written in a user-friendly style and with strong support from the Institute of Hospitality, each chapter includes international examples, bulleted lists, guides to further reading and exercises to test knowledge.